Generally known as "hookah" or "sisha" or waterpipe is an instrument used for vapourinzing and smoking flavoured tobacco whose smoke is passed through the water before inhalation. Well, who doesn't want to smoke a hookah. So , I also tried …. while smoking something came in my mind , I just thought is it safe ??? so I asked some of the smokers and this is what I got as a reply; “well, the smoke in hookah is passed through water.... so, the water filters all the harmful particles unlike ciggarates where there is nothing to filter the harmful particles. So, its harmless.” But this answer couldn't fulfill my curiosity. So , I just opened my laptop and started to look for hookah and its side effects. And then I got my answer. “hookah smoking is just as dangerous as ciggarate smoking” The popular belief that the water filters all the harmful particles is completely wrong. A 2005 WHO health report states that smoking waterpipes poses greater health hazards and is not a safe alternative to ciggarate smoking. According to a study a single hookah session delivers 50 liters of smoke whereas a single smoke delivers 0,5 liters of smoke. It produces 36 times more tar than ciggrates , 1.8 times nicotine produced by ciggarates and 8 times more carbon monooxide than ciggrate. The Lung Association of America has concluded hookah as a major risk factor . The major health risk associated with hookah smoking is cancer which includes varieties of cancer like lung cancer, oral cancer , gastric or duodenal cancer , various heart diseases. 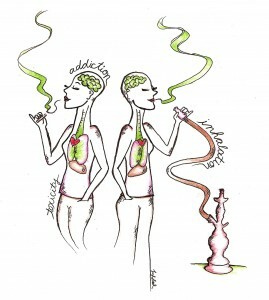 Diseases like herpes can be transmitted while sharing hookah. According to a study performed by the crimea medical university, it was found out that the water used in the hookah doesn't actually filters the smoke but instead it cools the smoke . So, the smoker has to inhale hardly and the smoke being cool passes deep in the lungs unlike ciggrates being hot doesn't enters the deeper parts of lung. But it raises a question to our modern society where the number of hukkah smokers are increasing everyday like a wildfire. And most of the smokers are none other than the youths. So , I think it raises a big question mark to our society?????????????? Marijuana vs Cigarettes, which is more dangerous . Why Marijuana is Illegal ?